HANOI, VIETNAM--(Marketwired - Oct 24, 2017) - Arrow Electronics, Inc. (NYSE: ARW) and the Vietnam IoT Alliance co-hosted an internet of things (IoT) technology seminar and exhibition today at the Melia Hotel Hanoi. 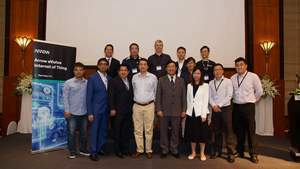 The event provided a platform for local startups and enterprises to acquire the latest IoT technology know-how, exchange industry insights, and collaborate with experts in order to hasten Vietnam's IoT development. "We are excited to see global technology companies like Arrow Electronics -- which is actively sharing its technology know-how, experience and solutions to help local innovators and entrepreneurs, especially a new generation of startups -- to drive adoption of IoT technologies," said Mr. Pham Hong Quat, director general of the National Agency for Technology Entrepreneurship and Commercialization (NATEC), Ministry of Science and Technology of Vietnam, in a welcome speech at the seminar. "Creating and designing smart and IoT-enabled devices requires expertise across a broad span of technologies -- from sensors, embedded compute, short and long-range wireless connectivity, gateways, cloud platforms, data analytics, device management, all the way to sustainable and secure end of life cycle disposition," said Mr. Natarajan MM, vice president of sales, South Asia for Arrow's Asia-Pacific components business. "As a global technology company, Arrow offers a robust technology framework and infrastructure with our 'sensor-to-sunset' IoT capabilities and offerings, which can help local startups and entrepreneurs aggregate and integrate diverse technology and solutions, and bring intelligent and connected products to the market faster."